Before I got into nail polish in a big way I was a bit of a nail polish snob. 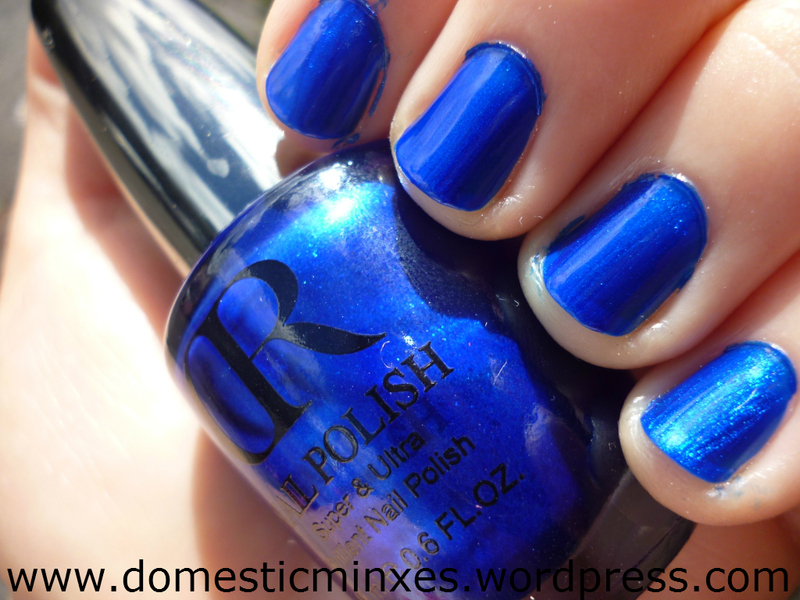 I would never have thought about buying nail polish from a dollar or discount store. First of all the displays were lacking and they always tucked away some where that you couldn’t see the colours too well. Once I discovered KleanColor which is a very inexpensive brand but with amazing quality, I went on a mission to try other cheap brands. Because surely if there was one amazing brand hiding in the teeny bopper infested discount stores there would be more. 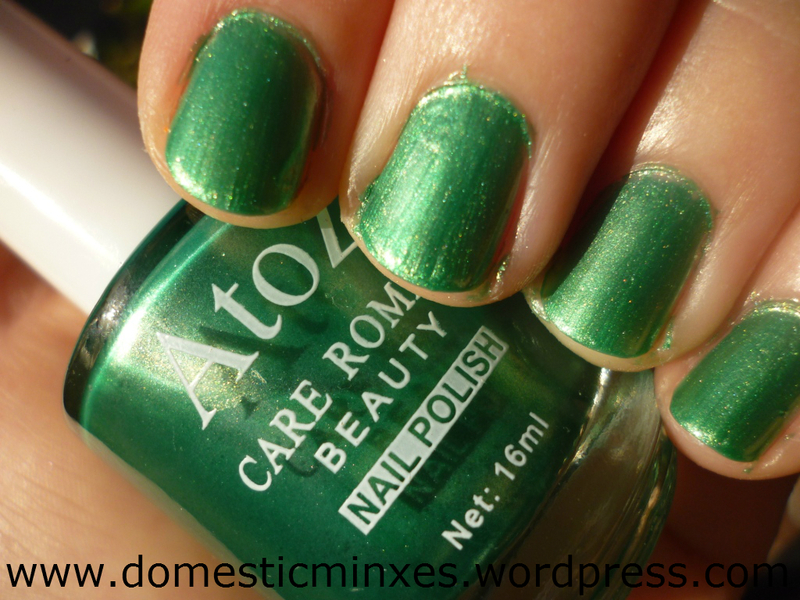 The brand that I have most recently discovered is CR polishes or Care Romeis Beauty. CR doesn’t seem to have a website that I can find and nor do they seem to have a big following online. However I am pleasantly surprised at the range of colours that are available. So far I have found them in random discount/variety stores out West Auckland. My biggest haul coming from A-Z in Henderson Mall. Each well sized bottle is $2.00 NZD and the Henderson store has amazing colours. So take a look at the colours I picked up last month, warning there are a tonne of pictures. The CR brand doesn’t actually name their colours, they just have numbers on the bottom. 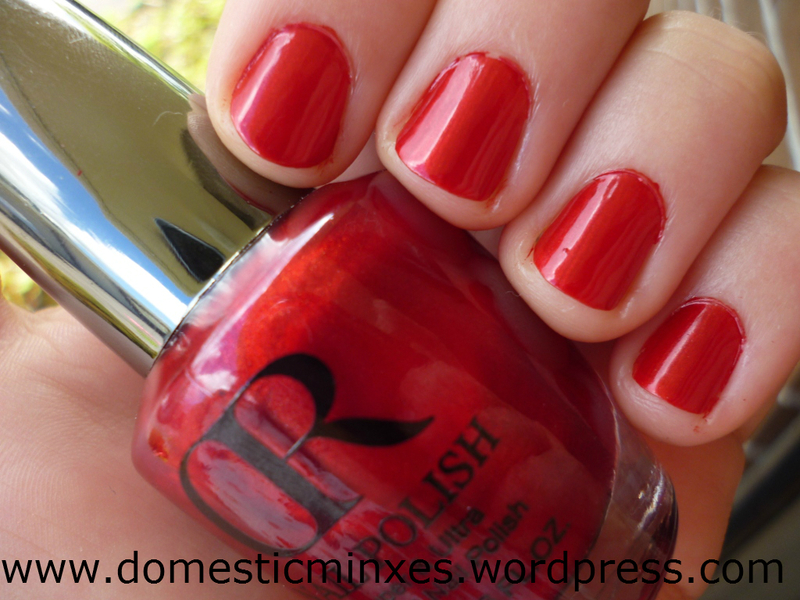 14. to me is a very vibrant red shimmer. You can see more of that shimmer in the sunlight, it has a little bit of orange undertone to it too. 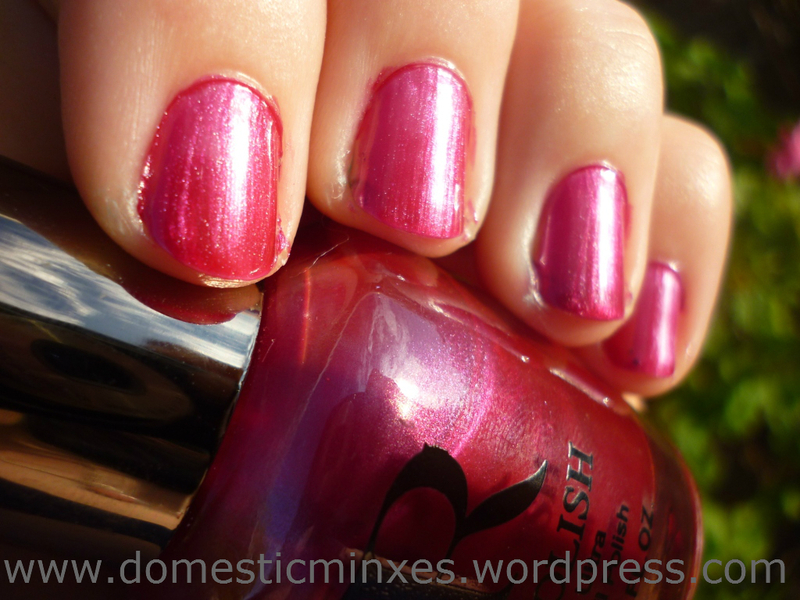 59 would be a dark pink that is quite pearly but with a hint of shimmer to it. 106 is a clear base with dusky pink micro glitter and gold and purple chunky glitter scattered through it. I think it looks awesome by its self but would awesome over another base colour. 113. is a dark silver foil I suppose that would be the best way to describe it. I was so impressed with the coverage, I barely needed the second coat. 28 would be my favourite a pearly aqua with a bit of shimmer to it. 06. is a shimmery Cobalt blue that matches my new shoes. This colour also barely needed a second coat. Doesn’t it look just amazing in the sunlight?? I am so impressed with the quality of this brand. 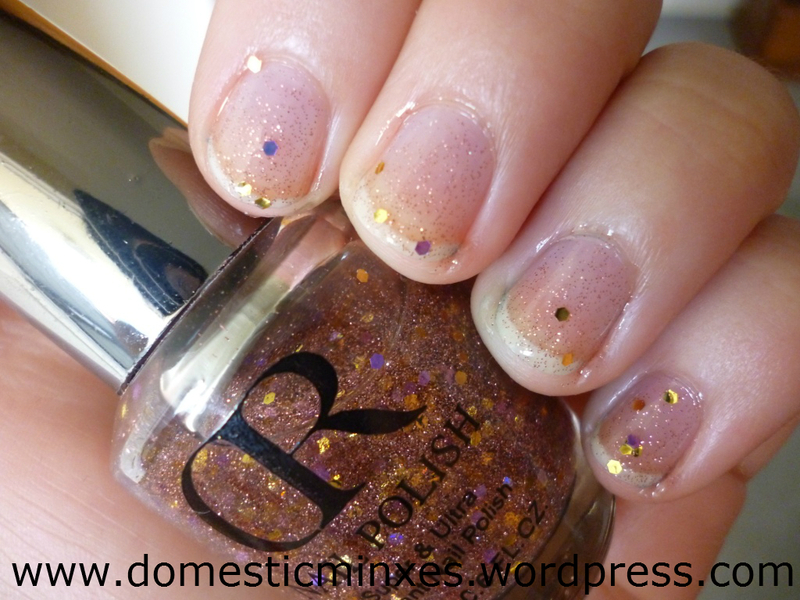 All of the polishes except for the glitter top coat you barely needed a second coat the coverage was the strong. It tried pretty quick, nothing super amazing there but what got me was how long it lasted. All week at work with only a few minor nicks at the tips of my nails. By sharing the inexpensive nail polish buzz with you I’m hoping to let you all know that you don’t have to spend all your money on getting a good variety of colours. You can get good quality, long lasting and amazing colour just for $2.00. I also want to encourage people who were like me to give different brands a go. Go forth my lovely readers and be brave! Try something new whether a new colour, new brand or even a store (be it discount or not). 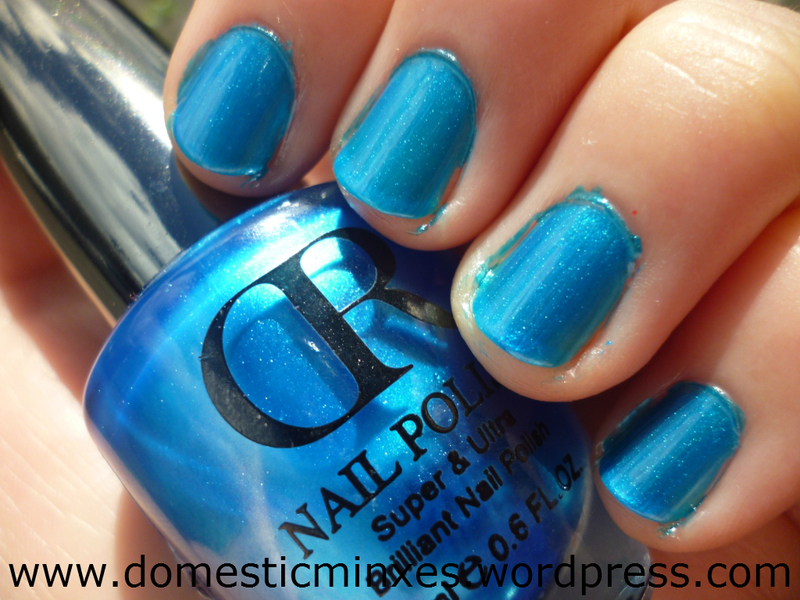 Do you have Spoiled or Sinful Colors where you live? If not, you would love them. They have a ton of colors and they are cheap. I got a ton of them recently. I just found these at my local dollar store in Canada! They had a special so they were 1$ CAD each! I got 59 and 28, as well as a pearly pink #30 and cream taupe #139. Thanks for reviewing these, I was just looking to see if anyone else had tried them before. It is too bad the caps look so cheap, as the bottles are dupe’s for OPI’s and I bet most people casually looking at them might not even notice the difference. How was the smell and how long do they last on you? Are they fast to chip? Or do they just get worn and do so gradually? There was no smell that I could notice. 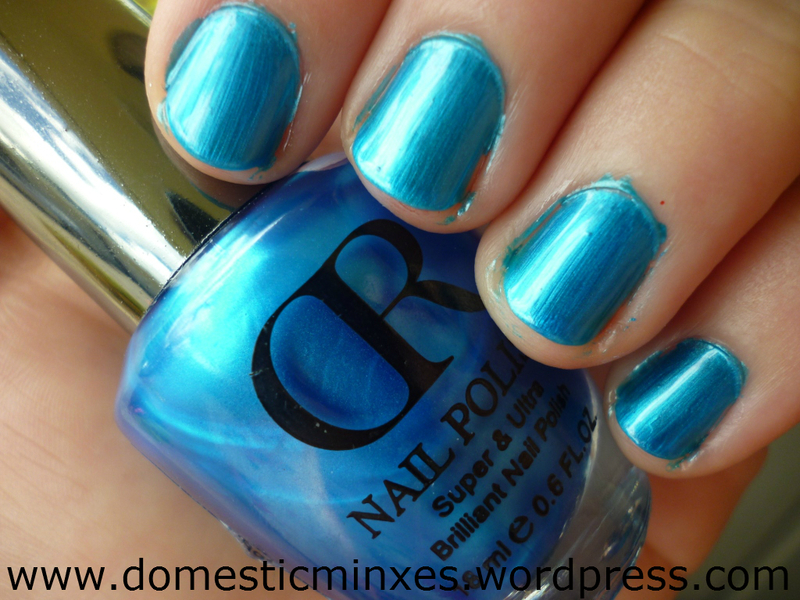 I use Orly no chip top coat which means with my job they last two days with next no chipping. I work in a library so it is hard on my hands and means some polishes come off by about lunch time. It sure does – thanks 🙂 ! 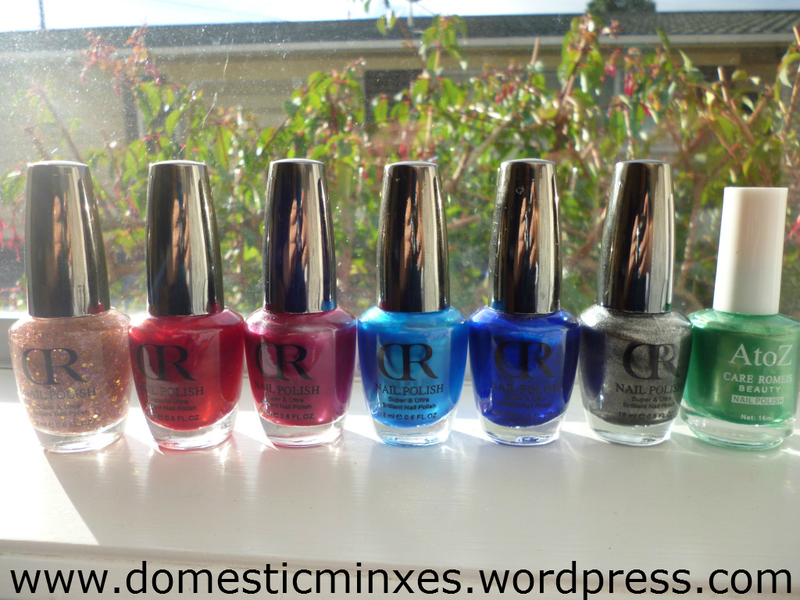 I really like your blog, it showed up when I googled CR nail polish as I have been experimenting with them. Keep up the rockin’ blog :). Hiya, I just found this. I use a lot of the Kleancolor and CR polishes. The black and white from CR are great for stamping, and the Kleancolor metallics (that I found at Postie Plus in the 6-pack minis) are great too. Do you think the silver CR you tried would be good to stamp with? I’m in west/central Auckland. I’ll let you know as soon as I know! How can I collect in Bangladesh?? I’ve recently discovered this brand too and only brought it to begin with cause my local ‘cheapie’ had a 50% off making them $1 each. I now have a small stash of 8 but hoping the sales are still going so I can grab some more. I mean for a $1 u can’t really go wrong. I too was amazed at the ‘no need for a second coat’ and also of the quality. Definitely recommend people try it out.